I feel one of the problems with international delivery is import and export charges. Please do not try and wind me up regarding these people..............take a bite out of the pie ....and see what you make of it.....L.O.L. I went up to Trago Mills near Plymouth to watch one of the Cornish Pipe bands performing.....I was wearing my old faithful Kilt at the time. Well done R.M.....this is the only book on Kilt making which my local book shop could find on their new or second hand filing system. Barb Tewksbury was one of Elsie's Kiltmaking students ......Elsie later approach Barb to help her record the art of kilt making for Posterity. The norm for a 6 foot bloke is to have a 24 inch hem from the navel to the knee on the floor. That noted YMMV and then some. Your kilt measurements are personal to you and you should measure from your navel to a knee on the floor and use that for your hem. My two formal kilts are set to those prescribed measurements all the rest are at the natural waist or to where ever I like to wear them. I have many SportKilts with the Velcro waist fastening and these are a universal fitting at or near the natural waist. The kilts and reverse kilted skirts that have the leather straps are worn just a shade higher. Outside of the formal wear it is all matter of what I am mixing and matching together with kilts (kilted skirts). or tights (leggings in winter) - gotta keep things sort of street legal - I am not in the Australian outback you know ! LOL ! After a few drinkies.....it is quite likely that the lassies will check their chosen victim to ensure he is attired as a True Scotsman....L.O.L. You have been warned of the Perils of Traditional Scottish Kilt wearing..............L.O.L. as part of his survival kit...to ward off the excessive curiousity of the lassies after a few drinkies........L.O.L. I am not sure about this on a male .............. or a female. denimini wrote: I am not sure about this on a male .............. or a female. Does this garment have a title ? Strange construction for a kilt not so much for a skirt ? Waist appears to be elastic ? Perhaps missing a front piece (apron) ? Certainly attention eye centering on the construction ! The construction is novel but not sure that it would be decent for either male or female as the unadorned triangle draws too much attention to another triangle. And underwear or not it just seems too indecent to me. 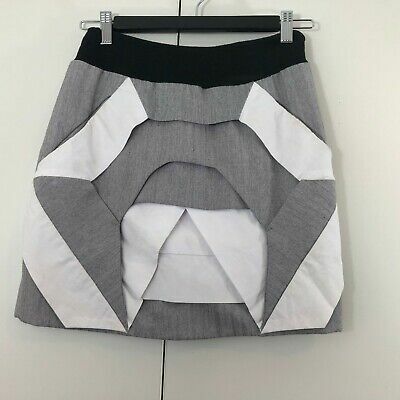 My latest skirt purchase on eBay. I have joined the designer skirt set; a Jacques Tchong micro. 13 zips; what could go wrong? Not something to wear in the presence of practical jokers. The colour hasn't shown up well, royal blue and black panels. Horror! Vertical stripes paired with horizontal stripes! Have you no class, man? No, seriously. A very interesting skirt. I dread to think what it looks like with all the zips undone! No, we don't want a pic! A good buy?